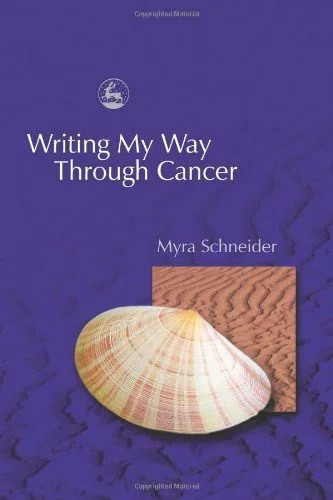 Writing My Way Through Cancer is a fleshed-out diary of the year when Myra Schneider was diagnosed and treated for breast cancer. It records her experience in diary entries, writing exercises, notes for poems and finished poems . These show the way she used writing to cope and record what else was going on in her life, also the fact that she finished writing the last third of a long narrative poem which had no connection with her illness. The focus is very much on the writing process. In the belief that writing can be very therapeutic the author has also included a section of ideas for writing which those affected by cancer or trauma of any kind might find supportive. These drops are not drops. The weak heads are not weak – not dropping, not drooping. They are hanging bells with thin rims of green on their delicate undersides. They have pushed through the lumpy earth and stand unmoved by the thrusting wind, the bites of cold air. They are stronger than cones of buddleia, than the can-can poppy – a brazen girl kicking. Very small, they bend but do not give way, they refuse winter, silently they remind me it can end. when I lose my left breast. timid girls running out of breath. its sudden bluster, cruel bite. fills me like an annunciation. Grevel said he thinks the sequence contains some of my best poems. He also opened up a new line of thought for me with this: ‘When I came to the poem The Cave where a voice reproaches you with “one-breasted” and “hardly a woman” I found myself thinking: “Ah but in ancient myths the most powerful women of all were, precisely, one-breasted. I wondered if you had looked at or might find it fruitful to look at the mythology surrounding the Amazons. They were the subject of fascination and a certain amount of fear to ancient Greeks, at least and a very frequent image in graphic art, especially vase painting. And although very martial they were certainly not thought of as unfeminine but rather in some odd way as too feminine for comfort… As I read Grevel’s words I had a sense of revelation – of a door opening to show a completely new vista. Lucy Hamilton, ARTEMIS poetry magazine.